From Kafka to Kooii, Laneous & The Family Yah to Vulture St. Tape Gang, West End’s prodigal son LANEOUS has made his long-awaited return to the studio and stage to reclaim his front-man throne! 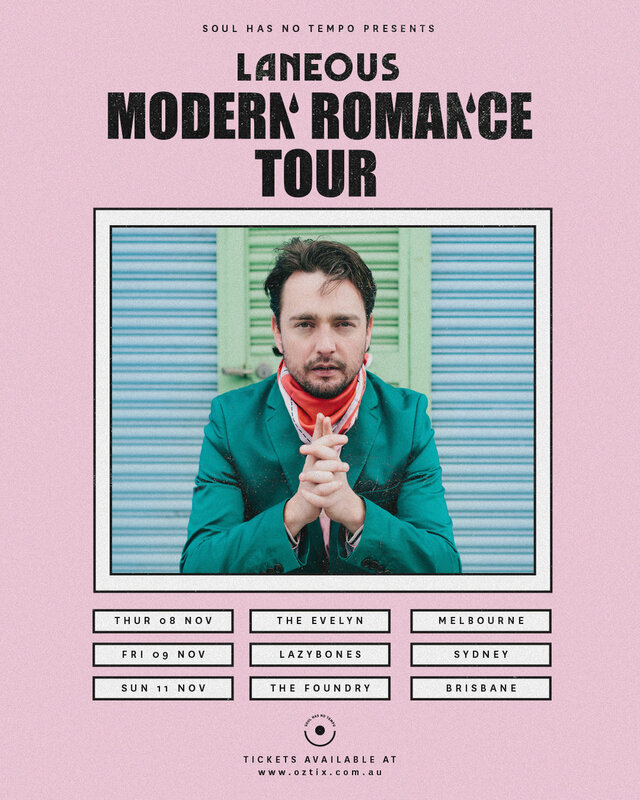 Soul Has No Tempo are proud to present the MODERN ROMANCE TOUR - a 3-stop run of shows celebrating the release of Modern Romance, the first single from his forthcoming debut solo album, out on the Brisbane-based label in 2019. Hitting Melbourne, Sydney and Brisbane in November, Laneous is bringing the full boy-band experience and sharing new, unreleased material from the record. After relocating to Melbourne in 2016, the world-class guitarist, vocalist, composer, visual artist and – significantly - muse, leapt to action when he was offered a stage at the pending Strawberry Fields festival. Excited to create new music with Laneous, Paul Bender and Simon Mavin of Hiatus Kaiyote came on board swiftly as collaborators for the event, joined by Donny Stewart (vibraphone and flugelhorn) and Hudson Whitlock on drums. Deadline looming, and with a room full of genius on their side, they infused controlled chaos with exotica & soul to produce a set which overflowed naturally into a record, with Bender taking the reigns as the album’s producer. The result, a delicate and delicious journey through a near two-decade career, is Laneous' long awaited solo debut: a sublime genre work peerless in Australia. A Modern Romance Experience not to be missed!